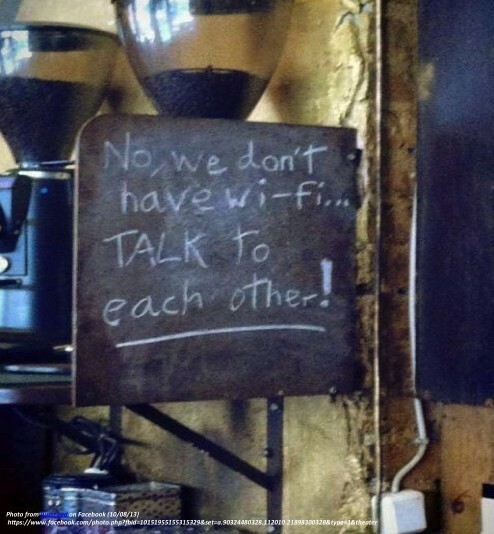 A few days ago a picture posted on Facebook: “No, we don’t have WiFi. Talk to each other!” I smiled, since it popped up while I was composing an article on engaging one’s audience in the age of the mobile device. Dedicating this piece to the coffee shop proprietor who was human enough to display the sign with pride and good horse sense. In ancient times, the “go getters” of the community would stand up and defend their people, values, or property by donning helmets, armor, shields, swords, and launch into an uncertain future to wage battle with their foes. Diplomacy was a matter of knowing who had the most muscle and supplies at their disposal. Today’s go getter soil faces an uncertain future in many ways. The difference? Our swords have been replaced with stylus pens, our shields with iPads, our helmets with wireless Bluetooth earpieces. Today’s warrior is often just a “Regular Joe” (or Jane!) with a Cup-O-Jo, launching his/her concepts to the invisible and infinite masses if cyber space. It’s the executive looking to further his/her company by cutting the latest deal, the teacher taking shortcuts by using that Blackboard App, the writers posting to blogs (ahem), the parents ensuring their children’s safety with parental tracking and data restrictions…. A series of recent discussions I’ve had led to the same conclusion: That we text, blog, ”like”/”follow”/”hide” statuses, because it’s just easier to deal with people through these indirect filters rather than to offer them your time and energy. It’s a type of emotional self defense. Often times, people we “friend”/”connect” with are virtual strangers – both figuratively and literally. The phenomenon has been addressed in several professional and social circles, rewarded by tracking systems like “Klout” and have led to an increasing trend of social ineptitude that is simply tragic. While it’s still generally considered rude to ignore a person who is addressing them directly, many people today justify the shift from eye contact (with the speaker standing in front of them) to iContact (with their computer or mobile device), making excuses about their busy schedules, how much easier it is to send a quick text rather than to engage in a lengthy meeting or call. In many cases there is often a great anxiety that setting the device down will result in the loss of business or some critical bit of information. There is an additional level of anxiety that plagues these cyber socialites. Excessive online communications has been linked to clinical depression, feelings of sadness and alienation, jealousy, etc. While social media outlets do help us feel connected to others to a degree, it is so essential to mete out one’s level of cyber-contact with live human interaction. Studies indicate that we need direct human contact, which engages us in a more holistic manner than the deceptively intimate online settings upon which many become fixated. Though most people currently spend a significant portion of their day communicating with each other online, they may hesitate repeatedly when it comes to simply picking up the phone and calling someone. It seems ironic, especially for those using their smartphones to communicate via text/email! Ironically, though we’re not bound to the clunky devices of the past — the chorded phone or even the desktop — it seems that creating the virtual arenas with which we communicate has caused us to lose something of the real and more tangible interactions of the past. We have so much more potential to enjoy open and positive communication, to use the plethora of portable devices to make plans and meet up, and yet we actively choose to lose ourselves to texting and browsing cyber profiles instead…. It’s amazing to see how readily we squander hours texting/IM-ing people with whom we’re barely acquainted. I often hear folks say, “I’d really love to call people more often, I just don’t have the time” — saying this, of course, as they are texting. Why not redirect that time to catch up with someone you actually know and like? Try to think back to the time when “online” was two words, when a “hangout” didn’t require a Google account, when “space” was a physical thing…. Friendships were a bit more tangible and felt more secure. This is an aspect of confident, comforting, successful communication that we can’t simply shrug off or swap out with frequent texting. “What’s the difference?” Some might ask. “Contact is contact, right?” Wrong…. What we need is less anxiety, less uncertainty, more “commitment” — the sort that comes naturally with direct and honest communication. It is, of course, possible to be honest and direct in writing. It is more difficult, however, to detect the finer nuances of the conversation that are more easily identified when you are speaking to a person, and even more so when you are face-to-face with them. Often times, there’s more room to “hide” and confuse your recipient via text — again, a sort of self defense that some textaholics prefer. How many times have I sat in on meetings with everyone only half-listening to the presenter, their noses glued to their smartphones/tablets? How many lunches/coffee hours are wasted on that friend whose eyes are fixed to the screen in front of him? How many live, face-to-face conversations are interrupted by non-urgent messages blipping onto the screen, redirecting the recipient’s attention? Too many to count…. And how does that make the person you’re ignoring feel? Insecure and frustrated, possibly wondering why they bothered to offer you their time and attention. In business, and in life, it’s so important to establish trust within the circles you inhabit. So many people today rely on “social media” to establish personal and professional relationships, but they don’t realize how important it is to reinforce the connection with face-to-face interaction. A good old fashioned meeting is one of the finer personal touches that tell the other person “your time and attention is valuable to me” and lend a sense of solidarity, comradely, and security that a real connection would offer. Positive body language – eye contact, facial expressions, a firm handshake, and so on – establish a sense of respect and interest amongst those you take the trouble to meet, instilling a sense of trust and community among them. It also gives you the opportunity to study your audience and understand what communicative approaches work best with them, what they like to hear, and what topics to avoid. The visual and auditory signs exchanged in a live meeting are priceless in this sense. Technological developers understand this concept, which is one of the many reasons why we have visually engaging communication programs like Skype and FaceTime. The need for sensory connection – for the visual verification that you are taking the time to be with the person in front of you – is invaluable to the person on the receiving end of your attention. By contrast, when you limit you interaction to email/texting, the recipient may not get the same sense that they have your undivided attention. The deep-seated, subconscious need for direct contact and visual affirmation are among those tricky, inescapable aspects of successful communication. My sincere thanks for reading this post to its conclusion. With a cyber *Smile and my cursor on “Publish,” I ask you to please close your browsers, log off your device and go interact with a real person. Set down that shield and armor, my dear reader, and just be yourself. Enjoy the positive energy of the day unfolding ahead.